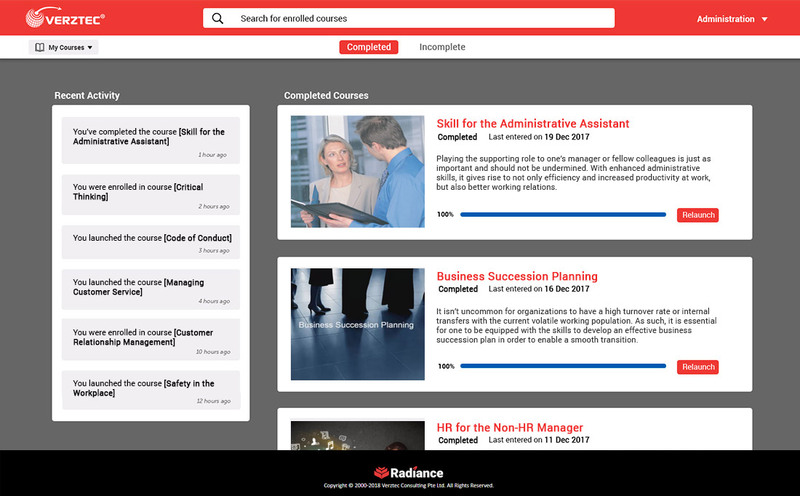 VerztecLearning™’s unique SCORM-compliant Learning Management System – Radiance™ allows you to activate human capital, strengthen employee competence and simplify performance management. On-Premise Radiance™ LMS Server Solution – Contact Us for more Details. Email learning@verztec.com or call us at +65 6577 4646. With this fully hosted learning platform, you can deploy e-learning courses you need to your employees located in any parts of the world, in a wide number of localized languages, on their desktops or on the move. This allows learning to take place at their own pace, at their own convenience and in their native languages. By deploying Radiance™ globally, companies can provide their learners with convenient access to a full suite of off-the-shelf courses as well as custom developed e-learning courses in various foreign languages. Radiance™ is also highly customizable to ensure an ideal fit for your company’s size and needs. The interface can be modified to suit your organization’s corporate image and the features are buildable depending on your requirements. VerztecLearning™ offers full customization and development of Radiance™ LMS in order to personalize the LMS features and User Interface to meet your company’s unique requirements. We understand that companies’ needs vary widely, and that no two companies are alike. For this reason, we have worked to ensure that Radiance™ LMS serves as a fully customizable learning management system, which can be tailor-made to fit your exact business needs. We work closely with you to identify your requirements, from the number of users, to how you want your branding set up, to whether you want your custom LMS to integrate with unique features to push it up a notch. We want to understand you and show you how your custom learning management system can be shaped to your needs, and how custom elearning could be the key to unlocking the potential of your staff and stakeholders. 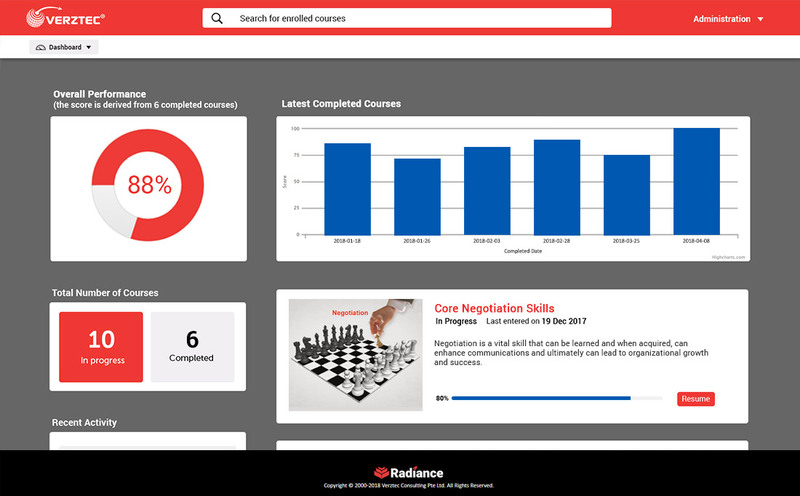 Radiance custom learning management system gives organizations the ability to change the color, branding and layout of the user interface. We can help upload your own logo and branding to your custom LMS. Change the look and feel of your custom LMS by changing the color and design. With Radiance™ LMS, instructors can create and define learning paths that can be personalized for their participants. This way the course material is relevant to their target participants and they do not waste time on things which are not applicable. 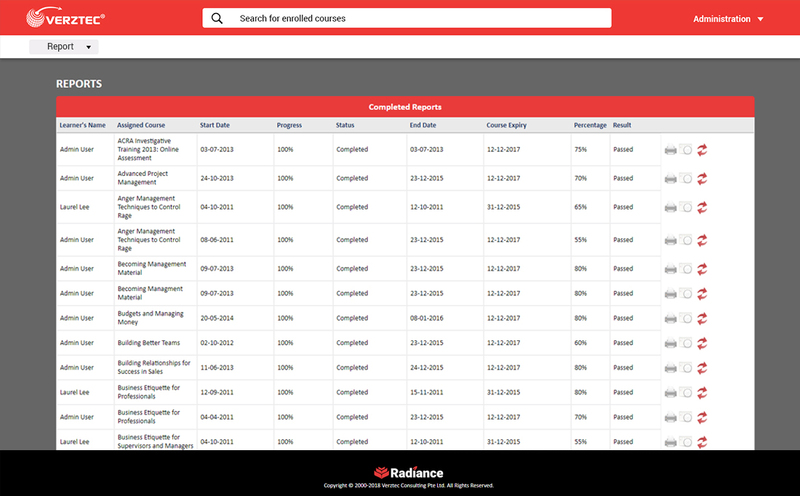 With Radiance™ LMS, we can help customize your reports in any way you like. With Radiance™ LMS, your own custom badges can be designed and used so that rewards for hard work or achievement are personalised. Likewise company certifications can be customized to include your branding. Managers and Learners are able to view the courses in the dashboard. Managers are able to Assign courses and Monitor learning progress of team members. Learners are able to have full visibility of their self-paced learning experiences. Discover the benefits of Radiance™ for your organization today. For more information, please email us at learning@verztec.com.